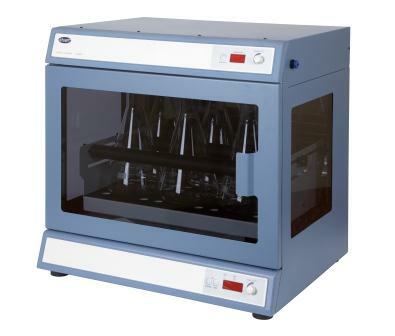 Ideal for scientists doing cell culturing procedures, especially suspension culture applications, the Stuart SI600C Cooled Incubator is a combined shaker and incubator. When the SI600C is combined with the SRC4 recirculating cooler (or equivalent recirculating cooler), the SI600C can operate at temperatures down to 15°C below ambient (min 5°C) making it also ideal for low temperature applications such as cell based protein expression. The unit remains compact enough to be positioned on the laboratory bench. The incubator features smoked acrylic windows in the door and to both sides to allow easy visibility of the samples, all viewing windows are double glazed to prevent condensation build up during sub-ambient use. The incubators temperature is set via a separate bright LED display, encoder control ensures that the temperature can be quickly set between ambient temperature minus 15°C (min. 5°C) and 60°C. Forced air circulation ensures uniform heating or cooling of the load. The Incubator has a versatile clamping system which secures most sizes and mixtures of flask up to 2 litres. Typically, the SI600C platform will accommodate the following Erlenmeyer flasks: 6 x 2000ml, 8 x 1000ml or 15 x 500ml. The SI600C also features a USB connection with dedicated software to enable long term monitoring of the incubator temperature, i.e. over weekends.